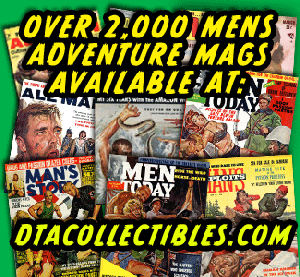 A couple of years ago, I created a Men’s Adventure Magazines Group on Facebook to provide a place where other fans of the genre could discuss the magazines, writers and artists and post their own favorite cover scans and interior illustrations. Since then, more than 200 people have joined the group and it has taken on a life of its own. It’s now a lively forum with regular posts. The posts include images, trivia and message trails that provide a unique resource, tapping the knowledge and collections of art experts, magazine collectors, artists, writers and fans from around the world. Recently, I realized that many readers of this blog may not be aware of the Facebook group or may simply have an aversion to Facebook. So, I decided to provide occasional updates here about some of the interesting discussions, artwork, covers, people and trivia that show up on the Facebook group. 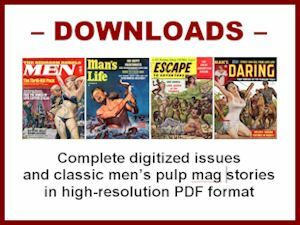 One of the regular visitors and contributors to the Men’s Adventure Magazines Facebook Group is the world’s foremost expert on men’s adventure magazine art, Rich Oberg. Rich owns hundreds of original cover paintings and interior illustrations that were used in men’s pulp mags. He also owns thousands of the magazines, probably the most complete collection in existence. 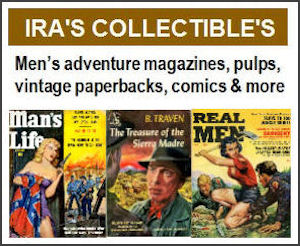 A portion of Rich’s collection is featured in the Taschen Publishing book MEN’S ADVENTURE MAGAZINES, which Rich created with writers Max Allan Collins and Steven Heller and vintage magazine and comic art expert George Hagenauer. 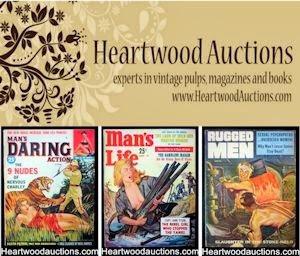 But Rich has a lot more that’s not in the book and often posts photos of original paintings and cover scans from his collection on the wall of the Men’s Adventure Magazines Facebook group. Many of them have probably never been posted anywhere else on the Internet. Some are photos of original artwork previously seen only by the artists and the art directors of the magazines the paintings appeared in or by a handful of art dealers and aficionados. Equally cool is the fact that Rich enjoys responding to posts, questions and requests by other members of the Facebook group. 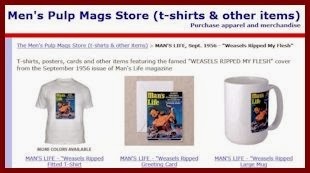 For example, a while ago a reader of MensPulpMags.com sent me a scan of the right half of the gonzo image shown at the top of this post. The part he sent me showed the legless Nazi hunchback pointing out a huge shark in a tank to three iconic scantily-clad damsels in distress who are bound to a stake. At the bottom of the illustration there’s a small caption that says “She screamed as the tentacles reached for her” — but there are no tentacles in sight on that single page. It was clearly one half of a two-page spread. However, the reader who sent it to me didn’t have a shot of the other page and didn’t know what magazine the illustration came from. He did note (and I agreed) that the illustration looked like it was done by artist John Duillo. I posted it in the Men’s Adventure Facebook group and asked if anyone knew what it came from. A while later Rich Oberg responded. It shows the tentacles the caption refers to. They belong to a huge squid in a tank next to the shark. One of the legless Nazi hunchback’s henchman is getting ready to feed the squid a hapless damsel for lunch. I called Rich and asked if he owned the original painting for that wild scene. He said no. However, he reminded me, he does own a lot of other great original John Duillo interior illos. He then proceeded to treat me and other members of the Men’s Adventure Magazine Facebook Group by uploading a series of photos of some of the Duillo interior artwork he owns. Most of these original paintings had never before been shown publicly until Rich Oberg posted them in our Facebook group. With Rich’s permission, I’m now making them even more widely available by posting them here on MensPulpMags.com. Lately, Rich has been uploading a lot of other rarely seen men’s adventure artwork from his collection on our Facebook group. I’ll repost more examples of those in future entries on this blog. If you want to check them out in the meantime, head on over to the Men’s Adventure Magazine Facebook Group. It’s a closed group, so you have to “request” to join. But anyone who is interested (and who doesn’t post anything annoying or offensive) is welcome to join.